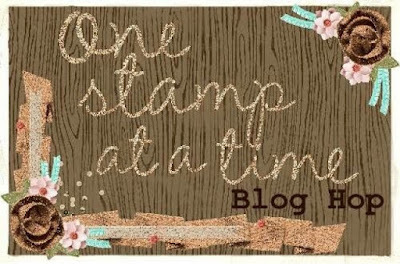 Hey everybody and welcome to the July One Stamp At a Time Blog Hop! This hop is full of some super talented paper crafters who will all be bringing you both a card and a project that are sure to inspire. This month's theme is Shabby Chic! I must admit that I actually had no idea what this style of crafting really encompassed but I did my research on Pinterest and off I went... and what fun I had creating this card! I wanted to go for lots of layers with plenty of distressed grunge to give it that "shabby" look. I also wanted to add some fancy stuff to make it "chic..." que the lace, pearls and splatter! I started with a base of Soft Sky and topped it with a layer of Smoky Slate. I did a lot of work on the Smoky Slate layer. I sponged it, stamped it and wrecked the edges with my finger nail. I love the way it turned out! I topped that with a lacy heart, flagged banners, lace, a length of banners and a beautiful two layer bird. My Sweet Sugarplum tag is sporting a little love from my White Stampin' Chalk Marker, a pearl and a little Clear Wink of Stella splatter. You can also see the layers of color and paper and lace in this shot. Something that I've never done before is to use my finger nail to break down the edges of my paper. I think about it often but worry about "ruining" my card... What the heck was I thinking?! I love this look and you can count on seeing it a lot more from me. Combine rough the paper up with some white ink, sponging and ink splatter... ooh, it makes me happy! Here's one last look at my first ever Shabby Chic card. I hope you like it as much as I had fun making it. Now on to my project we go. 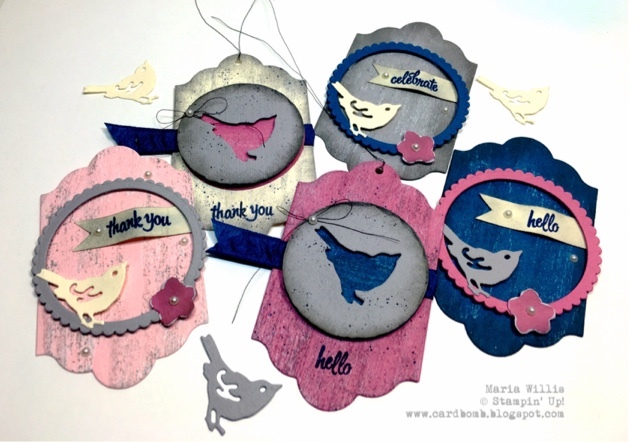 I decided to keep with the bird theme and I even stuck to a similar color scheme to make my tags. I used both the positive and negative pieces of the bird and I really like the way they both look. Here's a close up of the negative pieces. I think these are my favorites as they are striking and bold. These tags are a bit more whimsical than the first two. On these ones I made small banners for the sentiments and attached them with glue dots allowing the middle to pop up for some extra dimension. 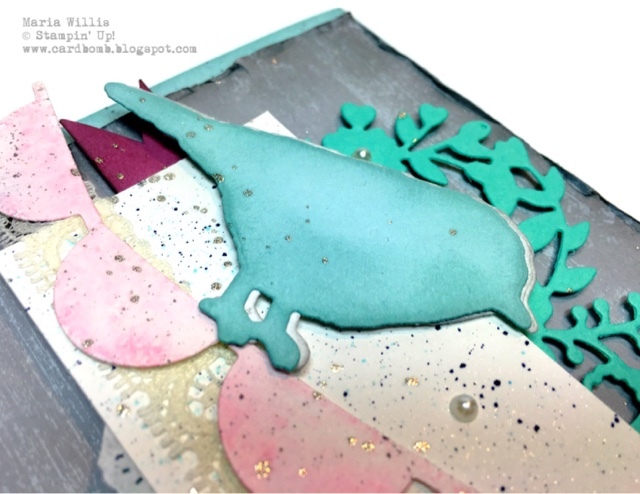 I traded out the Soft Sky of my card and used Pink Pirouette for one of my tags. Dapper Denim goes really well with all of these colors. Here they are again. I left a few of them without strings as I think they might end up on card fronts over the next couple of weeks. That's it from me today. I hope you liked what I had to share and I'm so glad you stopped by. I'll see you again soon but don't forget to keep on going with this amazing hop! There are sure to be some stunning projects. Enjoy! Next up on the hop is the talented Wynne Grob! Be sure to check her out! Adorable projects! 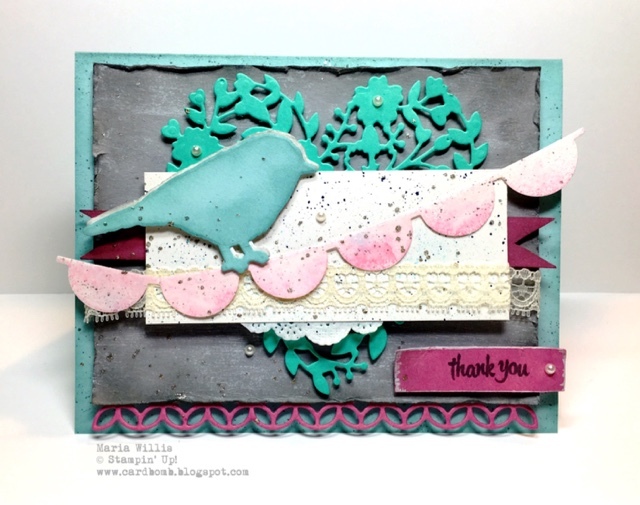 Love how you incorporated all the great framelits together and finished them off with the speckles! Shabby Chic it is! Love how all your elements have that antique look. 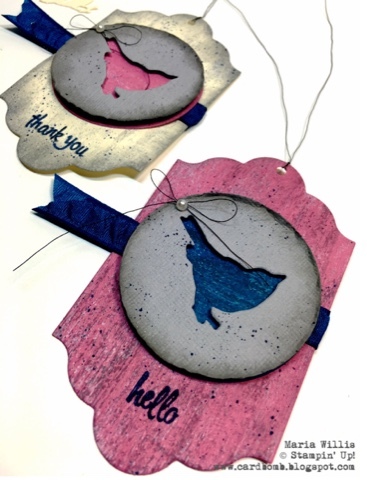 Very cool using the negative for the bird on your tags too! Thanks Kelly! It was figuring out a way to use the negative pieces! Absolutely stunning Maria! You have mastered Shabby Chic! 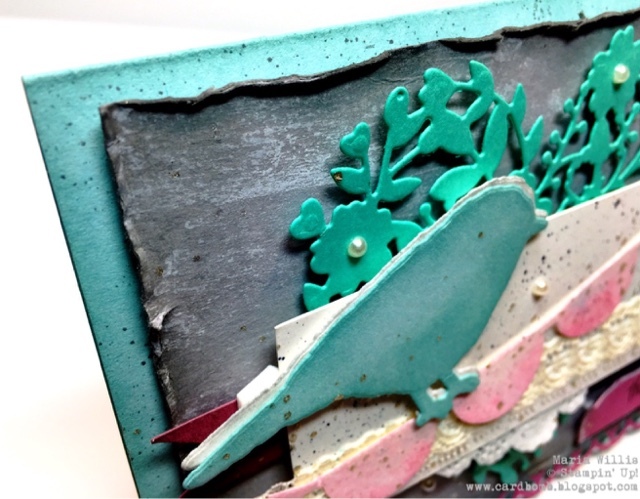 I just love all of the interesting layers in your card and those tags are so awesome! 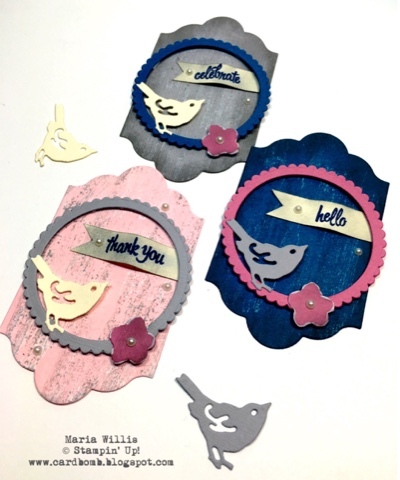 I love that you used the negative from the die cuts as well! Thank you Tina! It was so fun figuring out all of those layers! I love your take on shabby chic. It's not all flowers and lace, but bold and vibrant. The tags are adorable, and enough to make me want to buy the bird framelits. Thank you! I love bold, vibrant colors and am so glad you like my take on this style! Great card! Layers, colors, distressing, texture -- it's got it all. Guess what?! The tags made onto cards and were sold at an auction for charity! Oh, yeah! GORGEOUS! I love how they turned out. The fun, unique color combos and style make me think of the awesome Jane Lee and her fun style. These really are awesome. Wow! Huge compliment! Thank you Jeanna! Love the use of pinks/purples with the blues for shabby chic! Those tags are AMAZING!! Wow I love your projects! Great color combos, and such great aging and shabby goodness. 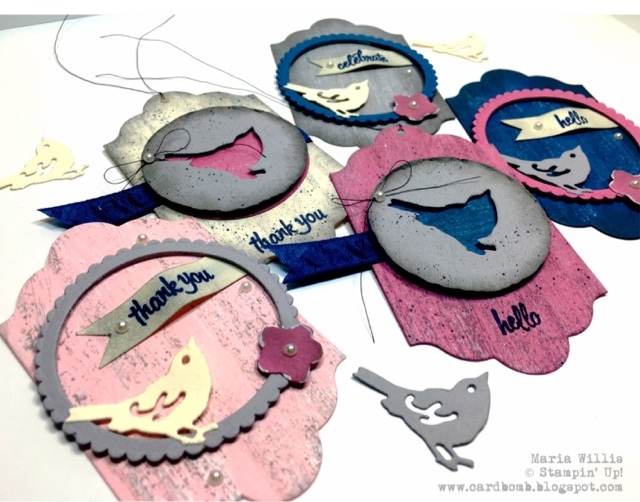 That bird bundle is on my list, but these projects make me want it now!